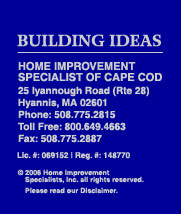 Home Improvement Specialists of Cape Cod has merged with Hamilton Homes, Inc. to provide residents of Cape Cod and Southeastern, MA one-stop shopping for all their building and home improvement needs. There is a vast difference between remodeling an existing home and new construction and that is why we aligned ourselves with Hamilton Homes, Inc. In addition to their new building expertise, they also share our operating principals of integrity, pride, superior customer service, quality and value. Hamilton Homes, Inc. has built over a hundred homes on Cape Cod and Southeastern, MA for homebuyers looking for style, comfort, quality and value. Hamilton Homes, Inc. has over 15 years of residential and commercial building experience and has twice been named "Home Builder of the Year" by the Massachusetts Home Builders Association of Cape Cod, along with a nomination for "Builder of the Year" by the Massachusetts Home Builders Association.